A perfect solution for those ladies who do not like to wear hats or fascinators. 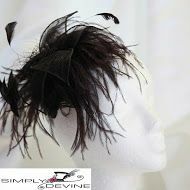 This cute little feather fascinator sits on a comb to slide into your hairstyle without giving you "hat hair". Pretty as a picture this feather and quill headpiece has a decorative petal and is held in place with a plastic transparent comb. Completely comfortable and secure, this is great for race days and mother of the bride or groom, especially if you prefer a no-fuss approach.